The 1971 Tour de France was the 58th edition of the Tour de France, one of cycling's Grand Tours. It took place between 26 June and 18 July, with 22 stages covering a distance of 3,608 km (2,242 mi). The race was won by Eddy Merckx, his third consecutive victory, although it had looked unlikely after the 11th stage, when Merckx was more than eight minutes behind Luis Ocaña in the general classification. But Ocaña had to retire from the race during the 14th stage after he crashed on the descent of the Col de Menté. For a more comprehensive list, see List of teams and cyclists in the 1971 Tour de France. The 1971 edition of the Tour de France consisted of thirteen teams, two less than the previous Tour. Teams were either invited or paid a participation fee. The Italian-based Salvarani and the Belgian Watney–Avia teams announced they would not be entering the race due to the high cost, although Salvarani later reached an agreement. The riders came from tweleve countries, with the majority of them coming from Belgium, France, Italy, Netherlands and Spain. Of the 130 cyclists starting the race, 37 were riding the Tour de France for the first time. Francisco Javier Galdeano (Kas–Kaskol) was the youngest rider at 21 years and 201 days, and the oldest was Ventura Díaz (Werner) at 32 years and 304 days. Eddy Merckx, who had won the 1969 and 1970 Tours, was the big favourite. 1970 second place finisher Joop Zoetemelk, Luis Ocaña, Bernard Thévenet, and 1971 Giro Winner Gösta Pettersson were among the GC contenders for podium positions. All pre-race predictions were that, unless he became ill or crashed, Merckx would be the winner, and there was speculation whether he would be able to lead the race from start to end. The Col du Tourmalet mountain pass in the Pyrenees was the highest point of elevation reached in the race at 2,115 m (6,939 ft). On 16 October 1970, it was announced that Mulhouse in eastern France would host the 1971 edition's opening stages (known as the Grand Départ), which consisted of a team time trial prologue stage and two further stages. The entire route was announced on 8 December at a press conference in Paris by race directors Jacques Goddet and Félix Lévitan. New rules to prevent the use of doping were introduced by cycling's governing body, the Union Cycliste Internationale (UCI); stages lengths were reduced, only twenty stages were allowed, and made rest days were made compulsory. The latter was a re-introduction to the Tour. At distance of 3,608 km (2,242 mi), it was shorter than the previous Tour by 646 km (401 mi), and was the shortest since 1905. With the new rules shortening the distance of the Tour and the increasing financial cost of running the Tour, the organisers maximised the amount route locations which paid the Tour to start, pass through or finish there. The previous Tour's split stages had drawn complaints from the riders, nevertheless, the 1971 Tour kept them as a means of income. There were total of five transfers which added up to a distance of 350 km (220 mi). Two were air transfers, a first for the Tour. The navigation of the host locations caused a loose figure of eight route, unlike the usual continuous loop. Although there were less stages and the Tour was shorter, there were more climbs, and it was thought the Tour was more suited to climbing specialists. Overall, the route was seen as easier than recent editions. Beginning in the Black Forest and Vosges Mountains, with visits to Switzerland and West Germany, the race then headed north-west to the coast passing through the Ardennes and south-east Belgium. After the first rest day and air transfer, racing resumed in the outskirts of Paris, taking the Tour through the Massif Central highlands and the Chartreuse Mountains towards the Alps. After the second rest day and a stage to the Mediterranean coast at Marseille, came the other air transfer, to Toulouse. The race then moved into the Pyrenees, with the closing stages taking place between the south-west and the finish in Paris. The Tour took place over 23 days, including the two rest days, between 26 June and 18 July. There were twenty stages, including a prologue and three split stages; two stages were split half and one in thirds. The longest mass-start full stage was the seventh at 257.5 km (160 mi), and stage 15 was the shortest at 19.6 km (12 mi), the shortest in the history of the Tour up to that point. There were three time trial events with a total distance of 81.1 km (50.4 mi), two were competed individually (13 and 20) and one was by raced in teams (the prologue). Of the remaining 22 full and split stages, twelve were officially classified as flat, four as medium mountain and six as high mountain. The highest point of the race was the 2,115 m (6,939 ft)-high Col du Tourmalet mountain pass on stage 16a. It was among seven first-category rated climbs in the race. The Tour included four new start or finish locations: Basel, in stage 1b; Marche-en-Famenne, in stage 4; Le Touquet, in stage 6b; and Gourette, in stages 16a and 16b. The race started with a team time trial as prologue, won by Merckx' team, which gave them a 20 seconds bonification for the general classification. After the first part of the first stage, Merckx' team mate Wagtmans briefly took over the leading position in the general classification, only to lose it to Merckx in the second part. In the second stage, Zoetemelk attacked early in the stage. Some cyclists, including Merckx, followed him, and soon a group of 15 cyclists was away. At the end, the margin to the rest of the field was almost 10 minutes. Merckx beat Roger de Vlaeminck in the sprint, and everybody not in the first group was no longer a threat for Merckx. In the seventh stage, the leader in the points classification, Roger De Vlaeminck, crashed and had to leave the race. Merckx was expecting a dangerous sprint so he chose not to participate. While Merckx took part in intermediate sprints and final sprints, Ocaña had been saving his energy on the advice of Jacques Anquetil, and waited for the mountains to come. Stage eight saw the first attack by Ocaña on the mountaintop finish of Puy de Dôme. Merckx was not able to chase him, and Ocaña got away. Zoetemelk and Agostinho also got away from Merckx, and gained some time on him. After that stage, Merckx was still leading, but only 36 seconds before Zoetemelk and 37 seconds before Ocaña. In the end of the tenth stage, Merckx lost contact after a flat tire, and lost time on Zoetemelk, Ocaña, Bernard Thévenet and Gösta Pettersson. Zoetemelk took over the lead, one second ahead of Ocaña. In the eleventh stage, Ocaña attacked. At first, Zoetemelk, Van Impe and Agostinho were able to stay with him, but Ocaña left them and soloed to the victory, more than six minutes ahead of Van Impe. Merckx and Zoetemelk finished in third and fourth place, almost nine minutes behind. Ocaña had set such a pace, that 61 cyclists finished outside the original time limit, leaving only 39 in the race. The time limit was consequently extended such that 58 more were allowed to start the next day. Ocaña seemed so strong, that Merckx abandoned the idea to win his third Tour. In the twelfth stage, Merckx organised an attack, and won back two minutes. This could have been more, had it not been for a mistake of an assistant team leader of Molteni, Merckx' team: when Bruyere had a flat tire in the chasing peloton, the assistant team leader called for the remaining members of Merckx' team to help Bruyere to get back to the peloton. The rival teams in the peloton were now without Molteni cyclists, and could organise the chase. The group with Bruyere was unable to get back into the peloton. Because of the high pace of Merckx in the first group, the group with Bruyere almost did not make the time cut, in which case they would have been eliminated. The average velocity of the winner was a new record, and the cyclists arrived one hour ahead of the earliest time schedule, and the preparations at the finish line had not been completed yet. The mayor of Marseille, where the stage ended, was so upset that he refused to let the race visit Marseille again. In the thirteenth stage, a time trial, Merckx was the strongest and won back more seconds. In the fourteenth stage, there was heavy rain. On the way up to the Col de Mente, Merckx attacked several times, but each time Ocaña was coming back. During the descent, Ocaña fell. Zoetemelk punctured and was unable to avoid him, and hit him at high speed. Ocaña was hit, injured his shoulder and had to give up, in what author Christopher S. Thompson named the most famous fall in race's history. Merckx became the new leader, but out of respect for Ocaña, he refused to go to the ceremony at the end of the stage, and refused wear the yellow jersey the next stage. Merckx considered to leave the race, because he did not want to win because of Ocaña's bad luck. Tour directors Levitan and Goddet convinced him to continue the race. The fifteenth stage was the shortest mass-start stage in the history in the Tour, at only 19.6 kilometres (12.2 mi). The decision was expected to fall in the first part of the sixteenth stage, when four mountains were scheduled. Van Impe, in second place, was expected to challenge the leader Merckx, and third-placed Zoetemelk could profit from their struggle. But although Van Impe tried to attack, Merckx was able to stay with him, and the three cyclists stayed together. By this point only Van Impe and Zoetemelk were within striking distance of Merckx, both being just over two minutes behind. Thevenet in 4th place was over six minutes behind and the rest of the field was well over ten minutes back. In the seventeenth stage, Merckx surprised Van Impe and Zoetemelk with attack, won the stage and increased his margin with more than two minutes. By winning the stage, Merckx solified his lead in the points classification. The time trial that closed the race was an easy win for Merckx. The battle for the second place was won by Zoetemelk. Of the 130 starters, 94 reached the finish of the last stage in Paris. In total, 100 doping tests were done during the 1971 Tour de France, from which 2 returned positive: Yves Ravaleu, after the thirteenth stage; Jean-Claude Daunat, after the eighteenth stage. Both received the customary punishment: a fine of 1200 Francs; being set back to the last place in the stage's results and getting ten minutes penalty time in the general classification. There were five individual classifications contested in the 1961 Tour and also a team competition. The most important was the general classification, which was calculated by adding each rider's finishing times on each stage. Time bonuses (time subtracted) of 20, 10 and 5 seconds were awarded to the top three positions, respectively, at the end every mass-start stage classified as flat. In the flat split stages bonuses of 8, 6 and 3 seconds were given. The rider with the lowest cumulative time was the winner of the general classification and was considered the overall winner of the Tour. The rider leading the classification wore a yellow jersey. Additionally, there was a points classification, where cyclists got points for finishing among the best in a stage finish. High finishes on flat stages awarded more points, 30 for the winner down to 1 point for 15th place. The flat split stages gave 20 points to the winner down to 2 points for 10th. In mountain stages and individual time trials, 15 points were given to the winner down to 1 point for 15th. Two mountain stages were given less points due their lengths, stages 15 and 16b. No points were awarded in the team time trial prolougue stage. The cyclist with the most points lead the classification, and was identified with a green jersey. The combination classification was calculated by adding each rider's overall ranking positions in the general, points, and mountains classifications. The rider with lowest combined total led the classification. In the event of tie, the positions were shared. The leader of the classification wore a white jersey. There was also a hot points classification. This classification had similar rules to the points classification, but only points were awarded on intermediate sprints, with 6, 4, 3, 2 and 1 awarded respectively. The classification was given more importance in 1971 with the introduction of time bonuses; 5, 3 and 1 seconds were awarded to the first three positions in the sprints respectively. In 1971, this classification had no associated jersey. In addition, there individual awards given after each stage, excluding the prologue, and at the conclusion of the Tour to the most combative, elegant and kind riders, with decisions made by a jury composed of journalists. The split stages each had combined winners. The combativity award was given to the rider who had made the greatest effort. Luis Ocaña won the overall super-combativity award. The most elegant award was given to the rider with the best morals, style and sporting elegance. The super-elegant award was won by Leif Mortensen (Bic). The most loved award was given the rider to have shown the most sportsmanship. Jean-Pierre Danguillaume (Peugeot) won the super-kindness award. There was also a special award, the Souvenir Henri Desgrange, given to the first rider (Wilmo Francioni of Ferretti) to pass the summit of the Côte de Dourdan in stage nineteen. A total of 470,600 French francs (f) was awarded in cash prizes in the race, with the overall winner of the general classification receiving 191,550 f. The stage winners, award winners and classification leaders, were rewarded with cash prizes. The kindness award winners received a selection of meat products. Joop Zoetemelk got a color television set for being the Tour's youngest finisher. Eddy Merckx (BEL) Molteni 96h 45' 14"
Joop Zoetemelk (NED) Flandria–Mars + 9' 51"
Lucien Van Impe (BEL) Sonolor–Lejeune + 11' 06"
Bernard Thévenet (FRA) Peugeot–BP–Michelin + 14' 50"
Joaquim Agostinho (POR) Hoover–de Gribaldy–Wolber + 21' 00"
Leif Mortensen (DEN) Bic + 21' 38"
Cyrille Guimard (FRA) Fagor–Mercier–Hutchinson + 22' 58"
Bernard Labourdette (FRA) Bic + 30' 07"
Lucien Aimar (FRA) Sonolor–Lejeune + 32' 45"
Vicente López Carril (ESP) Kas–Kaskol + 36' 00"
Francisco Galdós (ESP) Kas–Kaskol + 41' 59"
Primo Mori (ITA) Salvarani + 47' 44"
Antonio Martos Ortiz (ESP) Werner + 48' 13"
Herman Van Springel (BEL) Molteni + 48' 20"
Agustín Tamames (ESP) Werner + 49' 19"
Rini Wagtmans (NED) Molteni + 52' 50"
Désiré Letort (FRA) Bic + 57' 53"
Jean-Pierre Danguillaume (FRA) Peugeot–BP–Michelin + 59' 10"
Mauro Simonetti (ITA) Ferretti + 1h 03' 06"
Jean Dumont (FRA) Peugeot–BP–Michelin + 1h 03' 49"
Victor Van Schil (BEL) Molteni + 1h 08' 28"
Johnny Schleck (BEL) Bic + 1h 09' 35"
Michel Périn (FRA) Fagor–Mercier–Hutchinson + 1h 10' 19"
Luis Santamarina (ITA) Werner + 1h 10' 28"
Ottavio Crepaldi (ITA) Salvarani + 1h 12' 00"
Jean-Pierre Genet (FRA) Fagor–Mercier–Hutchinson + 1h 14' 52"
Jos Huysmans (BEL) Molteni + 1h 15' 41"
Bernard Guyot (FRA) Sonolor–Lejeune + 1h 16' 41"
Albert Van Vlierberghe (BEL) Ferretti + 1h 17' 47"
Jos van der Vleuten (NED) Goudsmit–Hoff + 1h 17' 48"
Mariano Martinez (FRA) Hoover–de Gribaldy–Wolber + 1h 19' 31"
Christian Raymond (FRA) Peugeot–BP–Michelin + 1h 23' 24"
Ventura Diaz (ESP) Werner + 1h 25' 30"
Raymond Riotte (FRA) Sonolor–Lejeune + 1h 26' 13"
Roger Swerts (BEL) Molteni + 1h 27' 52"
Francis Ducreux (FRA) Bic + 1h 28' 41"
Roland Berland (FRA) Bic + 1h 30' 57"
Gabriel Mascaro (ESP) Kas–Kaskol + 1h 33' 08"
Jean-Claude Genty (FRA) Bic + 1h 33' 57"
Barry Hoban (GBR) Sonolor–Lejeune + 1h 33' 59"
Robert Bouloux (FRA) Peugeot–BP–Michelin + 1h 35' 19"
Georges Vandenberghe (BEL) Salvarani + 1h 35' 42"
José Catieau (FRA) Sonolor–Lejeune + 1h 36' 12"
Joseph Spruyt (BEL) Molteni + 1h 36' 36"
Luis Balague (ESP) Werner + 1h 37' 15"
Jean-Claude Daunat (FRA) Hoover–de Gribaldy–Wolber + 1h 38' 38"
Kurt Rub (SUI) Hoover–de Gribaldy–Wolber + 1h 40' 41"
Charly Grosskost (FRA) Bic + 1h 41' 26"
José Luis Uribezubia (ESP) Kas–Kaskol + 1h 42' 05"
Jan Krekels (NED) Goudsmit–Hoff + 1h 42' 47"
Jean Vidament (FRA) Hoover–de Gribaldy–Wolber + 1h 43' 37"
José Manuel López Rodríguez (ESP) Werner + 1h 43' 57"
Jesús Manzaneque (ESP) Kas–Kaskol + 1h 44' 14"
Jean-Jacques Sanquer (FRA) Sonolor–Lejeune + 1h 44' 35"
Edy Schutz (LUX) Flandria–Mars + 1h 44' 51"
François Cocquery (FRA) Fagor–Mercier–Hutchinson + 1h 46' 05"
Frans Mintjens (BEL) Molteni + 1h 47' 19"
Ferdinand Bracke (BEL) Peugeot–BP–Michelin + 1h 47' 40"
Wim Prinsen (NED) Goudsmit–Hoff + 1h 49' 26"
Joseph Bruyère (BEL) Molteni + 1h 49' 35"
Nemesio Jimenez (ESP) Kas–Kaskol + 1h 49' 46"
Eric De Vlaeminck (BEL) Flandria–Mars + 1h 50' 09"
Gerben Karstens (NED) Goudsmit–Hoff + 1h 51' 51"
Wilmo Francioni (ITA) Ferretti + 1h 52' 14"
Alain Vasseur (FRA) Bic + 1h 57' 12"
Luciano Armani (ITA) Scic + 1h 58' 14"
Francisco Julia (ESP) Werner + 1h 59' 58"
Pietro Guerra (ITA) Salvarani + 2h 02' 34"
Yves Ravaleu (FRA) Hoover–de Gribaldy–Wolber + 2h 04' 06"
Willy Van Neste (BEL) Flandria–Mars + 2h 05' 10"
Rolf Wolfshohl (FRG) Fagor–Mercier–Hutchinson + 2h 05' 36"
José Manuel Fuente (ESP) Kas–Kaskol + 2h 05' 47"
Francisco Galdeano (ESP) Kas–Kaskol + 2h 06' 21"
Willy Teirlinck (BEL) Sonolor–Lejeune + 2h 08' 07"
Edouard Janssens (BEL) Flandria–Mars + 2h 08' 38"
Mat De Koning (NED) Goudsmit–Hoff + 2h 08' 48"
Raymond Delisle (FRA) Peugeot–BP–Michelin + 2h 09' 24"
Adriano Pella (ITA) Scic + 2h 13' 18"
Pierre Ghisellini (ITA) Hoover–de Gribaldy–Wolber + 2h 13' 52"
Henk Benjamins (NED) Goudsmit–Hoff + 2h 14' 46"
René Grelin (FRA) Fagor–Mercier–Hutchinson + 2h 18' 14"
Gert Harings (NED) Goudsmit–Hoff + 2h 25' 12"
Celestino Vercelli (ITA) Scic + 2h 29' 26"
Robert Mintkiewicz (FRA) Sonolor–Lejeune + 2h 35' 40"
Sandro Quintarelli (ITA) Ferretti + 2h 36' 19"
Silvano Davo (ITA) Salvarani + 2h 37' 51"
Jan Van Katwijk (NED) Goudsmit–Hoff + 2h 41' 37"
Jan van Katwijk (BEL) Fagor–Mercier–Hutchinson + 2h 41' 50"
Pierre Martelozzo (ITA) Peugeot–BP–Michelin + 2h 45' 45"
Julien Stevens (BEL) Molteni + 2h 47' 21"
Eric Leman (BEL) Flandria–Mars + 2h 51' 38"
Roberto Ballini (ITA) Ferretti + 2h 52' 26"
Pieter Nassen (BEL) Flandria–Mars + 2h 57' 48"
Georges Chappe (FRA) Fagor–Mercier–Hutchinson + 3h 04' 54"
Ferretti + 1h 22' 31"
Kas–Kaskol + 1h 35' 39"
Werner + 1h 51' 43"
Fagor–Mercier–Hutchinson + 1h 56' 08"
Flandria–Mars + 2h 10' 32"
Hoover–de Gribaldy–Wolber + 2h 13' 11"
Riders in the Tour competed individually for points that contributed towards the Super Prestige Pernod ranking, an international season-long road cycling competition, with the winner seen as the best all-round rider. Eddy Merckx held his substantial lead in the ranking at the end of the Tour. This Tour de France was considered the most exciting in recent years. From this year's race the second, third and fourth place finishers, Joop Zoetemelk, Lucien Van Impe and Bernard Thévenet would each win at least one Tour during their careers. Ocana fully recovered from his injuries, and would win the 1973 Tour de France. ^ a b No jersey was awarded to the leader of the mountains classification until a white jersey with red polka dots was introduced in 1975. ^ a b c "The history of the Tour de France – Year 1971 – The starters". Tour de France. Amaury Sport Organisation. Archived from the original on 6 April 2019. Retrieved 6 April 2019. ^ "The history of the Tour de France – Year 1970 – The starters". Tour de France. Amaury Sport Organisation. Archived from the original on 6 April 2019. Retrieved 6 April 2019. ^ "Gimondi met naar de Tour" [Gimondi not going to the Tour]. de Volkskrant (in Dutch). 26 May 1971. p. 17 – via Delpher. ^ "Dertien ploegen in de Tour" [Thirteen teams in the Tour]. de Volkskrant (in Dutch). 11 June 1971. p. 17 – via Delpher. ^ "Tour de France 1971 – Debutants". ProCyclingStats. Archived from the original on 6 April 2019. Retrieved 6 April 2019. 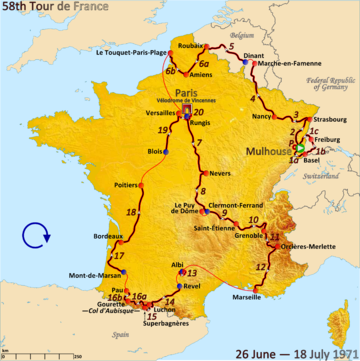 ^ "Tour de France 1971 – Youngest competitors". ProCyclingStats. Archived from the original on 6 April 2019. Retrieved 6 April 2019. ^ a b c d e "Klimmers in het voordeel in de Tour de France 1971" [Climbers in favour in the Tour de France 1971]. Leeuwarder Courant (in Dutch). 24 June 1971. p. 21 – via De Krant van Toen. ^ "Mulhouse startplaats Tour 1971" [Mulhouse starting place 1971 Tour]. Het Vrije Volk (in Dutch). ANP. 16 October 1970. p. 9 – via Delpher. ^ "Tour de France korter" [Tour de France shorter]. Het Vrije Volk (in Dutch). 9 December 1970. p. 6 – via Delpher. ^ a b c d e "Tour de France 1971 wordt achtvormig" [Tour de France 1971 becomes eight-shaped]. Leeuwarder Courant (in Dutch). 9 December 1970. p. 17 – via Delpher. ^ a b c "Tour '71 op een na kortste uit de historie: Financiële eisen van organisatie na dreigementen verzacht" [Tour '71 second shortest in history: Organization requirements after threats mitigated]. de Volkskrant (in Dutch). 25 June 1971. p. 13 – via Delpher. ^ a b c "Tour de France 1971: De zwaakste sinds vele jaden" [Tour de France 1971: The weakest in many years]. Limburgs Dagblad (in Dutch). 24 June 1971. p. 9 – via Delpher. ^ Augendre 2016, pp. 108–109. ^ a b c d e "Ronde van Frankrijk" [Tour de France]. de Volkskrant (in Dutch). 25 June 1971. p. 13 – via Delpher. ^ a b c d e "Tour de France 1971". Limburgs Dagblad (in Dutch). 26 June 1971. p. 18 – via Delpher. ^ Dauncey & Hare 2003, p. 271. ^ McGann & McGann 2008, pp. 54–55. ^ a b c "58ème Tour de France 1971" [58th Tour de France 1989] (in French). Mémoire du cyclisme. Archived from the original on 7 April 2019. Retrieved 7 April 2019. ^ a b c d e ""Spelregels" Tourkaravaan" ["Game rules" Tour caravan]. Limburgs Dagblad (in Dutch). 28 June 1971. p. 13 – via Delpher. ^ Thompson 2008, p. 34. ^ "58ème Tour de France 1971 - 2ème étape" (in French). Mémoire du cyclisme. Archived from the original on 26 September 2012. Retrieved 2 March 2011. ^ "Groten veroorzaken ravage: Merckx kan opnieuw juichen" [Great people cause havoc: Merckx can cheer again]. Nieuwsblad van het Noorden (in Dutch). 29 June 1971. p. 14 – via De Krant van Toen. ^ a b c d e f McGann & McGann 2008, pp. 53–66. ^ "Val ontneemt De Vlaeminck groene trui" [Val deprives De Vlaeminck green jersey]. Nieuwsblad van het Noorden (in Dutch). 5 July 1971. p. 16 – via De Krant van Toen. ^ "Historische dag in de Tour" [Historical day in the Tour]. Nieuwsblad van het Noorden (in Dutch). 8 July 1971. p. 17 – via De Krant van Toen. ^ a b "Luis Ocana geeft Tour sensationele wending" [Luis Ocana gives Tour a sensational twist]. Nieuwsblad van het Noorden (in Dutch). 9 July 1971. p. 13 – via De Krant van Toen. ^ "Merckx berust in nederlaag" [Merckx is in defeat]. Nieuwsblad van het Noorden (in Dutch). 10 July 1971. p. 23 – via De Krant van Toen. ^ a b "Eddy Merckx slaat toch terug" [Eddy Merckx hits back]. Nieuwsblad van het Noorden (in Dutch). 12 July 1971. p. 13 – via De Krant van Toen. ^ a b c "Merckx wil Ocana's trui niet dragen" [Merckx does not want to wear Ocana's jersey]. Nieuwsblad van het Noorden (in Dutch). 12 July 1971. p. 16 – via De Krant van Toen. ^ "58ème Tour de France 1971 - 15ème étape" (in French). Mémoire du cyclisme. Archived from the original on 26 September 2012. Retrieved 2 March 2011. ^ "Merckx nu wel zeker van derde Tourzege" [Merckx now certain of third Tour victory]. Leeuwarder Courant (in Dutch). 15 July 1971. p. 11 – via De Krant van Toen. ^ "Merckx gaat toch in de Tour nog heersen" [Merckx will still prevail in the Tour]. Leeuwarder Courant (in Dutch). 16 July 1971. p. 9 – via De Krant van Toen. ^ "Merckx benadrukt overmacht in tijdrit" [Merckx emphasizes force majeure in time trial]. Nieuwsblad van het Noorden (in Dutch). 19 July 1971. p. 15 – via De Krant van Toen. ^ a b c "The history of the Tour de France – Year 1971 – Stage 20 Versailles > Paris". Tour de France. Amaury Sport Organisation. Archived from the original on 6 April 2019. Retrieved 6 April 2019. ^ "Twee Fransen "positief"". Limburgs Dagblad (in Dutch). 19 July 1971. p. 9 – via Delpher. ^ a b c Nauright & Parrish 2012, p. 453. ^ a b "Spelregels in de Tour" [Rules of the Tour]. Leidsch Dagblad (in Dutch). 29 June 1971. p. 13. Archived from the original on 8 April 2019. Retrieved 9 April 2019 – via Delpher. ^ a b van den Akker, Pieter. "Het puntenklassement (groene trui) in de Tour de France" [The points classification (green jersey) in the Tour de France]. TourDeFranceStatistieken.nl (in Dutch). Archived from the original on 26 March 2019. Retrieved 8 April 2019. ^ a b c "Wandeletappes" [Walking stages]. Trouw (in Dutch). 11 June 1971. p. 11 – via Delpher. ^ a b c d e f g "De Ronde in cijfers" [The Tour in numbers]. Gazet van Antwerpen (in Dutch). 26 June 1971. p. 18. Archived from the original on 7 April 2019. ^ van den Akker, Pieter. "Het bergklassement (bolletjestrui) in de Tour de France" [The mountain classification (polka dot jersey) in the Tour de France]. TourDeFranceStatistieken.nl (in Dutch). Archived from the original on 26 March 2019. Retrieved 8 April 2019. ^ a b c Nauright & Parrish 2012, p. 454. ^ van den Akker, Pieter. "Combinatieklassement" [Combination classification]. TourDeFranceStatistieken.nl (in Dutch). Archived from the original on 26 March 2019. Retrieved 8 April 2019. ^ van den Akker, Pieter. "Tussensprintklassement" [Intermediate sprints classification]. TourDeFranceStatistieken.nl (in Dutch). Archived from the original on 26 March 2019. Retrieved 8 April 2019. ^ a b c Nauright & Parrish 2012, p. 455. ^ van den Akker, Pieter. "Ploegenklassement" [Team classification]. TourDeFranceStatistieken.nl (in Dutch). Archived from the original on 26 March 2019. Retrieved 8 April 2019. ^ "De Ronde in cijfers" [The Tour in numbers]. Gazet van Antwerpen (in Dutch). 28 June 1971. p. 15. Archived from the original on 13 April 2019. ^ "De Ronde in cijfers" [The Tour in numbers]. Gazet van Antwerpen (in Dutch). 3 July 1971. p. 15. Archived from the original on 13 April 2019. ^ "De Ronde in cijfers" [The Tour in numbers]. Gazet van Antwerpen (in Dutch). 15 July 1971. p. 22. Archived from the original on 13 April 2019. ^ a b c d e f g h "De Ronde in cijfers" [The Tour in numbers]. Gazet van Antwerpen (in Dutch). 19 July 1971. p. 15. Archived from the original on 6 April 2019. ^ "Feiten en cijfers van de Tour" [Facts and figures of the Tour]. NRC Handelsblad (in Dutch). 19 July 1971. p. 11 – via Delpher. ^ Wadley 1971, pp. 58–62. ^ van den Akker, Pieter. "Informatie over de Tour de France van 1971" [Information about the Tour de France from 1971]. TourDeFranceStatistieken.nl (in Dutch). Archived from the original on 2 March 2019. Retrieved 2 March 2019. ^ a b Wadley 1971, p. 62. ^ a b c "Clasificaciones oficiales" [Official classifications] (PDF). El Mundo Deportivo (in Spanish). 19 July 1971. p. 19. Archived (PDF) from the original on 28 February 2017. ^ "Classifica finale" [Final ranking]. Corriere dello Sport (in Italian). 19 July 1971. p. 7. Archived from the original on 6 April 2019. ^ "Eindstanden in de Tour" [Final positions in the Tour]. Leeuwarder Courant (in Dutch). 19 July 1971. p. 9. Archived from the original on 4 April 2019 – via De Krant van Toen. ^ "Merckx battra-t-il le record du super-prestige?" [Will Merckx beat the record for super-prestige?] (PDF). L'Express (in French). 19 July 1971. p. 9. Archived (PDF) from the original on 6 April 2019 – via RERO. ^ "Merckx onaantastbaar in Super Prestige Pernod" [Merckx unassailable in Super Prestige Pernod]. Limburgs Dagblad (in Dutch). 21 July 1962. p. 15 – via Delpher. ^ "Een mythe is voorbij". Nieuwsblad van het Noorden (in Dutch). 12 July 1971. p. 13 – via De Krant van Toen. Dauncey, Hugh; Hare, Geoff (2003). The Tour de France, 1903–2003: A Century of sporting structures, meanings and values. London: Frank Cass & Co. ISBN 978-0-203-50241-9. Fotheringham, Alasdair (2014). Reckless: The life and times of Luis Ocana. London: Bloomsbury Publishing. ISBN 978-1-4088-4602-5. Fotheringham, William (2012). Merckx: Half man, half bike. London: Yellow Jersey Press. ISBN 978-0-224-07448-3. Friebe, Daniel (2012). Eddy Merckx: The cannibal. London: Ebury Press. ISBN 978-0-09-194316-5. Wadley, J. B. (1971). Eddy Merckx, Luis Ocana and the 1971 Tour de France. Silsden, UK: Kennedy Brothers. OCLC 483164. This page was last edited on 14 April 2019, at 01:11 (UTC).